In 2016, Stratford Town Trust secured a £100,000 grant from the Heritage Lottery Fund to support Death Reawakened – a major project to conserve and showcase the Guild Chapel’s wall paintings. 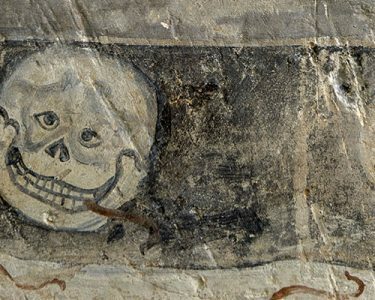 The conservation of two of the best-preserved wall paintings – the Doom and the Allegory of Death – began in the autumn of 2016 and is now complete, allowing visitors to see the paintings in detail not seen since the 16th century. Conservators also discovered fragments of the Lyf of Adam and Dance of Death paintings, hidden behind the wooden panelling running down both sides of the Chapel. The uncovering of these previously undocumented paintings dating back more than 500 years caused a huge stir of excitement, with the conservators concluding The Guild Chapel is one of only a handful of places in Europe to have an almost complete medieval decorative scheme still in situ.